Papua New Guinea introduced its own notes and coins Currency on the 19th April 1975. The name of the dollar equivalent is Kina and the name of the cent equivalent is Toea. The Kina is the major unit and one single kina is equivalent to one hundred toeas. 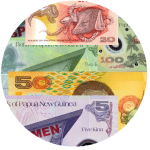 To learn more about Papua New Guinea’s currency on notes and coins click above notes and coins images. Papua New Guineans had been living in rural areas as subsistence farmers where a family or clan is self sufficient in producing what they need for for their own consumption. Goods they could not produce or make themselves were exchanged for goods they had in abundance. However during, the colonial period PNG evolved from a subsistence to a markedly monetary economy. The transition from a subsistence based to a modern exchange economy was part of the inevitable cultural and social changes which occur within a society over time. In this transformation of economic processes PNG became urburnised, industrialised and monetised. This was the era in which the people learnt to use money in its different traditional forms until it finally became the Kina and Toea we know today. In PNG where there are more than 800 different languages and traditional cultures, there are also many different types of traditional monies used for exchange of goods. These included the Tabu shells, pig tusks, kinas and toeas. Many of this traditional monies or currencies functioned as a means of payment, as an accepted standard of value and as a store of wealth. It was amongst all this traditional monies used up in the highlands, in the coastal areas and along the New Guinea Islands regions that the name Kina and Toea was selected for our national Currencies. The word ‘Kina’ in found in both Pidgin and Kuanua languages and it refers to the caluable pearl shell used widely for trading in both the Coastal and Highlands areas of PNG. This shell is traded from the coastal areas into the highlands and is a traditional store of wealth. The Toea is the name of a very valuable type of shell used for trading and bride price ceremonies in the Motuan Coastal villages. It is very valuable because it is found in the depths of the ocean and only at certain times of the year. After extracting the flesh from the shell a lot of work is done before it finally comes out as an armshell and becomes a means of payment, standard of value and store of wealth. During the colonial period and before the introduction of the Kina and Toea, Papua New Guineans used German Marks and Pfennings, Japanese Yen, Australian Pounds, Shillings and Pence and most recently Australian Dollars. 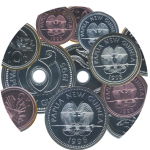 PNG introduced its own notes and coins Currency on the 19th April 1975. The name of the dollars equivalent is Kina and the name of the cent equivalent is toea. The Kina is the major unit and one single kina is equivalent to one hundred toeas. The First issue of Kina was in four denominations K2, K5 and K10 Bank notes and K1 coin to replace the existing Australian dollar. The K20 Banknote was issued in 1977 and the K50 Banknote was issued in 1990. The first issue of Toea was in five denominations 1t, 2t, 5t, 10t, and 20t. For the eight months until the end of 1975 both the Australian Dollar and the Kina were both fully accepted. However, on the 1st of January 1976 (at the end of this dual Currency period) PNG gained full monetary independence. This meant that the dollar was withdrawn from circulation as it was no longer legal tender of the country. The front of the notes shows the national crest and other design patterns from various provinces. The back of the notes features many of our traditional tools for fishing, hunting and gardening from the many different tribes and traditional cultures in the country. To help protect our currency from counterfeiting, our banknotes have various security features. These include the slightly raised printing of the Bank of PNG logo and the numerals, the security thread in the star dust method and offset printing used on the National parliament building featuring multi-coloured patterns. The most advanced security features are that the banknotes are in polymer substrate. Secondly, the see through clear window with printed Bank of PNG logo and the numerals in micro lettering and the embossed figures. Finally, the third security feature evident on the notes is the intaglio printing of certain designs on the front and back of the note. The other advanced security features are also incorporated into the note but can only been seen under a UV light. The Bank issues new notes to commemorate certain occasions for the country. In April 1985 the Bank issued a new redesigned K10.00 Banknote commemorating the new National Parliament Building. In 1991 the Bank issued its first K2.00 Banknote in polymer substrate with the Bank logo in a clear window to commemorate the 9th South Pacific games held in the country. A special overprint of the South Pacific Games was placed on the note to mark the occasion. Again in 1995 a special K2.00 in polymer was issued to commemorate the 20th anniversary of independence. The Bank issued its first fifty toea coin in 1980 to commemorate the 4th South Pacific Festival or Arts held in PNG. Also in 1991 the second issue of fifty toea coins was introduced to commemorate the ninth South Pacific games held in PNG. On the 19th of April 2000 a special K5.00 commemorative note was issued to mark the 25th anniversary of our kina and toea currency. This note retains the same design and security elements of the existing K5.00 note but incorporates a special overprint of the stylised PNG flag in a silver filigree foil on the front lower right side of the note.